Hello, I’m Alanna, the new Family Programs intern, assisting with Free First Saturday. I’ll be posting periodically on events relating to Raising Creative Kids, as seen from my behind-the-scenes perspective in the Education and Community Programs Department. For my first blogging assignment I decided to sit down with Ilene Krug Mojsilov, The Walker’s Art Lab Coordinator to see how the upcoming Dan Graham exhibition would be used to fuel a creative art activity that she’s designed for Nov 7th Free First Saturday. Dan Graham is a conceptual artist, among many things—a photographer, performer, video artist and critic. He has been working since the 1960’s in New York and is considered a pioneering figure in many modes of art. His retrospective, Dan Graham: Beyond, organized by the Museum of Contemporary art, Los Angeles opens at The Walker on Oct 31. 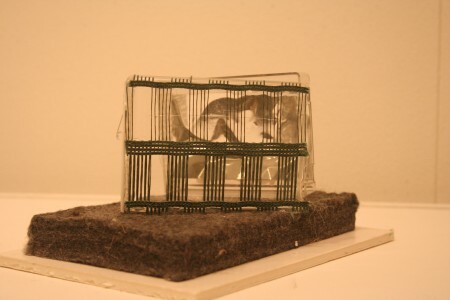 A lot of Dan Graham’s pieces are works of installation. How do you get kids to understand the concept of an installation? Well first I get them to define the word “install.” I start out with the question: “Who knows what it means to install something? I liken the idea to a kitchen that needs to be redone and how an object like a stove, fits in the space. Dan Graham’s work often challenges viewer’s perceptions. He creates environments where the viewers see themselves and are seen by others. Tell me how your art activity relates to this idea of perception. The activity is called Mirror, Mirror. It is made from human-made materials, different from natural materials. Plastic, glass, lumber, steel, and metal are examples of elements used in architecture. I ask children to manipulate materials like plastic, Mylar, and foam core so that they can envision what a space could be. In this way, the art becomes self-reflective, as they can infuse their own lives in it. I ask the kids to use three different types of surfaces, transparent, meaning material you can see through; translucent, material you can see partially through; and opaque, material you cannot see through. What are the reasons or intentions behind the project? I like people to play with the idea of space by using materials that play with light. We all perceive space differently. Light and shadow are ingredients in this recipe for a space. I also hope that this activity gives participants a way to delineate personal and public space. How will the kids get this? I always like to relate an artistic work to their own experience. I tell them, “Think of your bedroom.” In this way, the children are able to use the materials with specific purposes that arise from their own imaginations of familiar places. Can this work for all ages? Yes. Older kids can see the project as an interior design project. To younger kids, it can be an outdoor installation. It would be suitable for 3 years olds to teens. Ilene is giving accessibility to contemporary art. It is a genre I admit I am not familiar with. This seems to be an experience where the children are introduced to conceptual art without even knowing it. You’re offering an experience where they don’t get bogged down with definitions. Exactly. They don’t get bogged down with definitions. It seems like you enjoy the experiential side of learning. I like to learn that way…I like when there’s a challenge. Our conversation dips into discourse about teaching methods. I am beginning to discover Ilene’s passion—her identity as an independent thinker, gutsy, intuitive and someone who discovered her own kinesthetic learning style early in life. She draws on this strength in challenging kids in the creative process. I want all people to experience the creative process. I do my job because I’m discovering something. How do you initially think of ideas? I am inspired by other artists and exhibitions. I think: What could I do with this? What can I take? I borrow from these influences. That’s what makes working in museum education so interesting. There is always something new, a new exhibition…I never get stuck. No…like cleaning out my closet. I find new ways of looking at the everyday. That’s always been part of my experience…finding connections to the present. 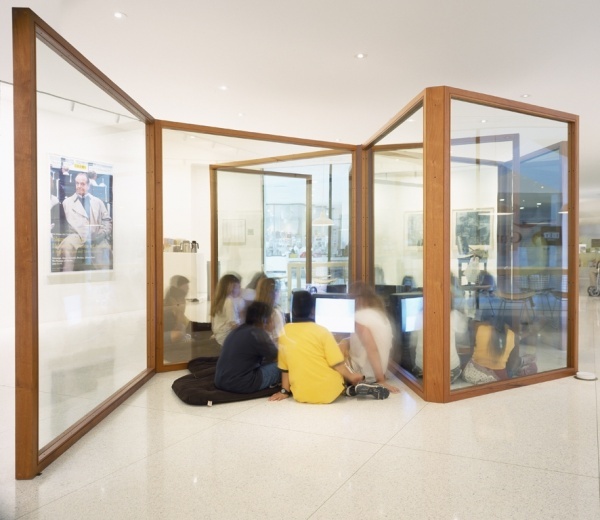 Using Dan Graham’s exhibit, Mirror Mirror will construct a creative way for children to connect with their present.